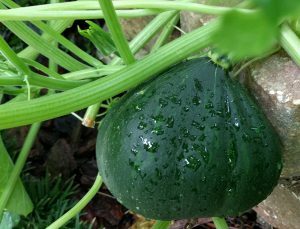 If your squash plants fall victim to bugs or powdery mildew like mine do, here’s the solution – grow Seminole Pumpkin! While bugs feast on my other squash plants, they ignore the Seminole Pumpkin, which grows… and grows… and grows. If Seminole Pumpkin isn’t a Florida native, it was at least an early settler. These cousins to butternut squash were grown by Seminole indians as far south as the Everglades. Traditionally, the vines were planted at the base of a dead or girdled tree and would twine up the trunk, resulting in the unlikely sight of pumpkins hanging from the branches. Today they are most often grown on the ground, where the vines can root along their length and pull more nutrients from the soil. The Seminole Pumpkin can be substituted for butternut squash or sweet potatoes in recipes, and its flavor is somewhere in between the two. The shell is very tough, so it’s easiest to roast them as halves or wedges and then cut off the rind. The roasted chunks can be frozen to use in soup or casseroles. They also store for several months when fully ripe. To grow, first you need a lot of sunny space! The vines are very large, running 30 feet or more. They will outgrow a normal suburban landscape bed and make an assault on the neighbor’s yard. But given elbow room, the vine will reward you with huge yellow blossoms for stuffing, as well as many cantaloupe-sized pumpkins. Seminole Pumpkin vine escaping from a landscape bed. Seeds aren’t commonly sold in stores, so you’ll probably need to order them online. Since the Seminole Pumpkin is part of the Slow Food Ark of Taste, which promotes delicious and culturally distinctive foods that are facing extinction, their website lists several suppliers. Plant the seeds in spring or early summer and keep watered until the vine is established. The leaves are often mottled – don’t worry, it’s not powdery mildew. The vines get quite large and seem to wait for longer late summer days before setting fruit. Until then, male flowers can be picked and stuffed for a tasty side dish. The pumpkins turn dull orange or tan when fully ripe. Many gardeners wait for the vine to dry up or be killed by frost to ensure the pumpkin is as sweet as possible. 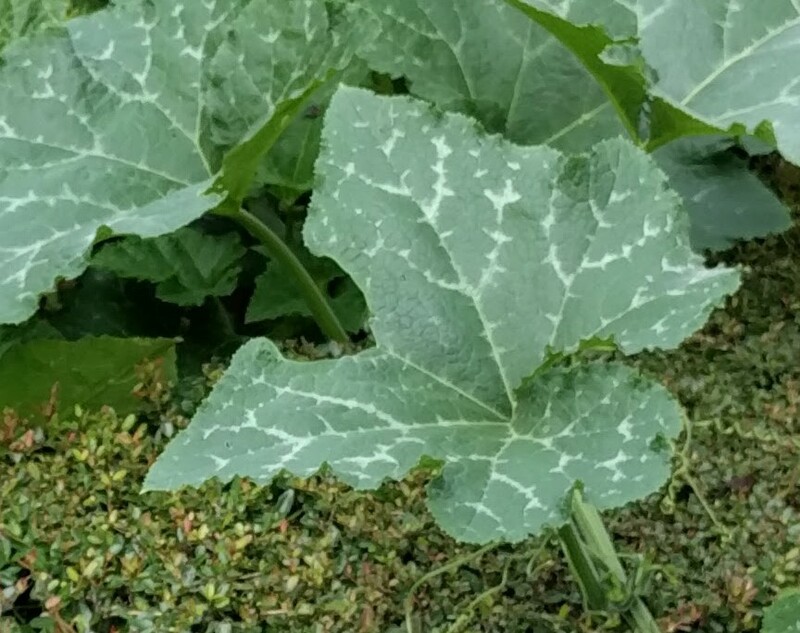 For more information, see http://gardeningsolutions.ifas.ufl.edu/plants/edibles/vegetables/seminole-pumpkin.html. Mottling is normal on Seminole Pumpkin leaves. If you have the space, Seminole Pumpkin is easy to grow. Give this tasty heirloom a try! This blog post was written by UF IFAS Extension Orange County Master Gardener, Mary Ann Pigora, class of 2017. The UF IFAS Extension Orange County Master Gardener Volunteers play a crucial role in the outreach of UF IFAS Extension.